.... The heresy’s starting-point is that this world is too fundamentally flawed to be the creation of a perfect God. Rather, the Gnostics speculated, it was the work of the Demiurge, a partially corrupted emanation from the supreme deity. The ultimate divinity remains hidden from mankind. Even so, buried deep within us, there are inklings of its existence, discernible by those inherently gifted with spiritual insight, or possessed of the appropriate secret formulae. For the Gnostics, then, religious knowledge was confined to the superior intellect. To such sophisticates there could be no absolute truth or morality, merely intuitions gathered by the favoured few. As for Christ, while He might be regarded as a valued teacher, he could hardly be part of the Godhead. 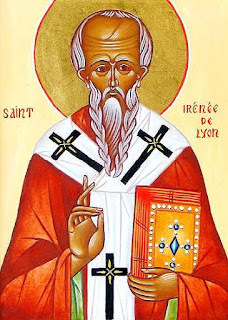 Irenaeus perfectly captured the smugness that Gnosticism imbued: “As soon as a man has been won over to their way of salvation, he becomes so puffed up with conceit and self-importance that he imagines himself to be no longer in heaven or on earth, but to have already passed into the fullness of God’s powers.